You guys, look what came in the mail! Last year I finally got to see an Uppercase book that I borrowed from my library. Botanica was a wonderful compilation of artists and crafters using flowers and/or floral imagery in their work. 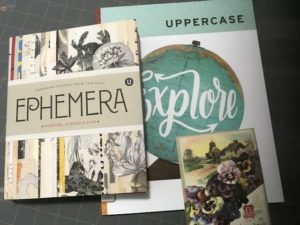 When I read that book I also found out that coming soon Uppercase would have a new publication, this time on Ephemera. As a lover of all kinds of paper stuffs I couldn’t wait until this book came out. My copy arrived and I’m so excited. Of course I actually had to order something else to make the shipping worthwhile and I also ordered a back issue of the magazine. Ephemera has beautiful pictures from artists’ studios. 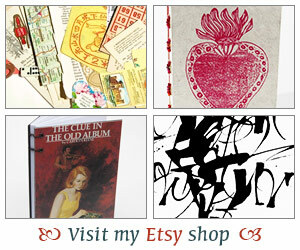 Vintage bus tickets, stamps, flash cards, you name it and it is in here. I love the colors and the collections. I collect a lot of ephemera as well for my crafting so you can imagine how fun it is to look through this. In this edition of the magazine you can find articles on wandering book artists, a traveling bookstore and postcards. I’ve paged through both publications a bit and I can tell I’m going to go back to time and again for inspiration and just eye-candy. If I didn’t have to go to work tomorrow I think I’d sit around all day and indulge. I know it’s a bit pricey but I am seriously thinking of getting a subscription. Let me know if you’ve ever checked out this magazine or if you’ve recently discovered a cool new magazine. I checked on these after seeing something about them on Margarete Miller’s site, but didn’t order. Now I may have to give in! So tempting! I can see why you are thinking of subscribing, Iliana.